A sniper is not just a good shot. While marksmanship is crucial, it is not this alone that defines the sniper. Snipers must also be superb bushmen, possess limitless patience, iron discipline, rat cunning, extraordinary stamina and attract more than their share of luck. The well-trained sniper will stalk his enemy or lie in wait for his target to appear. He will eliminate his target with just one shot and escape to repeat his mission time and again. 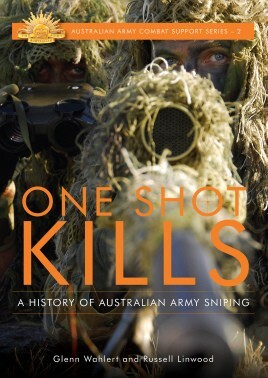 The history of the Australian Army is replete with untold tales of brave men who built reputations as daring and skilful snipers. From the training grounds of the Boer War and First World War, Australian snipers honed their deadly skills and earned a fearsome reputation. In the Second World War they duelled with their German counterparts in the Western Desert and the hardy Japanese snipers of the Pacific War. The valuable lessons of two major wars had to be relearned for the Korean War where ‘naïve young men who knew nothing of combat sniping' learned quickly or didn't survive. The snipers of today's Australian Army have learned the lessons of history and are held in the same high regard by friend and foe as their Gallipoli forebears. Snipers have become an essential force multiplier and have deployed on every operation since Somalia. One Shot Kills is the story of the sniper's journey from the South African veldt to the recent battlegrounds of Iraq and Afghanistan. It is also the story of the development of the modern sniper's combat weapon system in which technology has been harnessed to produce extraordinary results on the battlefield. Australian Army snipers are justifiably regarded as among the best in the world. Glenn Wahlert was born in Melbourne in 1956. He is a graduate of the Officer Cadet School Portsea, Army Command & Staff College, Deakin University and the University of NSW. After 20 years of service in the regular Army he transferred to the Army Reserve where he is currently a member of the Army History Unit, Canberra. In his ‘day job’ he is a member of Defence’s Senior Executive Service and holds the appointment of Director General of Industry Strategy in the Defence Materiel Organisation.Lieutenant Colonel Wahlert is a qualified Army marksman and the author of several books and journal articles on topics ranging from military history to high-technology crime. Lieutenant Colonel Russell Linwood, ASM is a graduate of the Royal Military College and an infantry officer with over forty-years’ experience. As an Officer Instructor at the Australian Army’s Infantry Centre during 1976-77,he was instrumental in resurrecting formal sniper training for the Australian Army after a gap of four decades.A qualified Army marksman and sniper, Russell is a three times winner of the Army Top 20 Marksman Badge, co-winner of the 1988 Billy Sing Trophy for sniper pairs and was a runner-up in the World Marksmanship Championships in 1991. Since transferring to the Army Reserves Russell has maintained his interest in sniping, including acting as technical advisor to a number of books on shooting, military sniping and snipers.